On July 5th my wife Becky & I were in the Lisman community making preparations for the upcoming July 18-20 Fun in the Field Mission VBS from 9-12 each morning. We were erecting an advertizing banner in front of the old Lisman school where the event will be held. Suddenly a lady named Cynthia came up to us thanking us and saying "God bless you." She explained that her daughter had received a flyer at CCES from Bro. Terry but had lost it and was sad because she wanted to come, but had forgotten the date. Of course our banner had the time and date. She was so happy to get the date and asked if we had any more flyers. We had a whole bunch in the car for distribution so I asked her if she needed more than one. "Oh yes, I want some to pass out to my neighbors, and if you have enough, I want to get some for my church, Mt. Nebo. " I gave her 30 or 40 and she gave me a big hug. 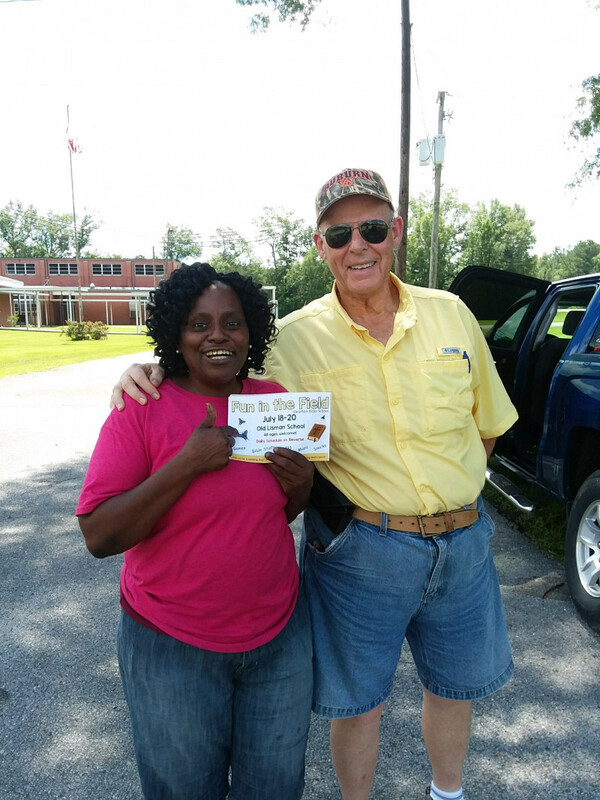 Here is a picture Becky took of Cynthia and I with one of the flyers in front of the old school. Is this wasn't a divine appointment, I have never seen one.